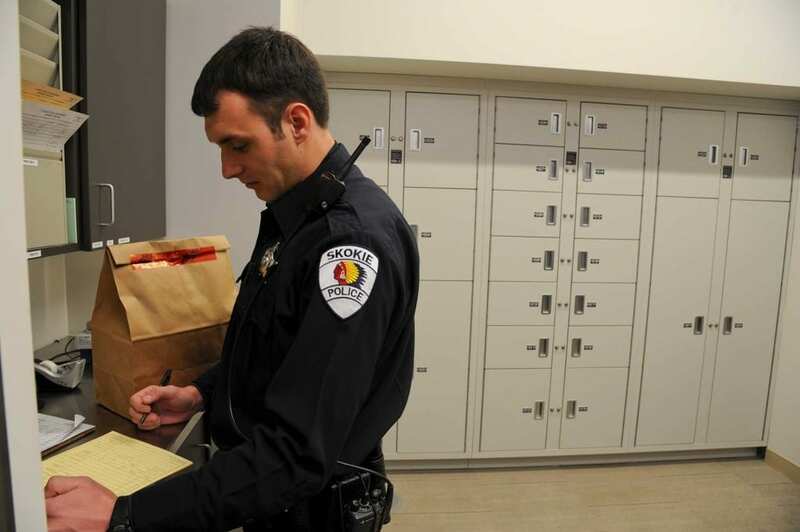 With that fast growth came more than a few growing pains—particularly for Skokie’s police department. 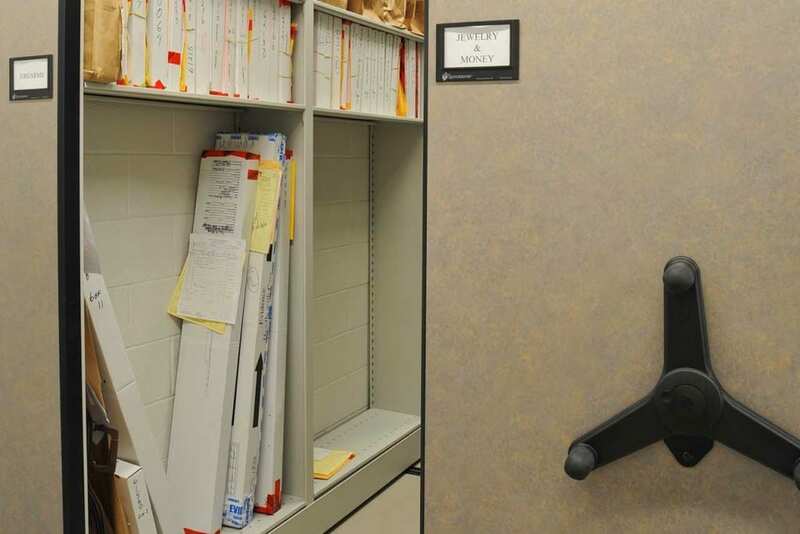 The department had outgrown the 27,000 square foot building it had been in many years before—the storage systems were inadequate and simply couldn’t support a modern police force. Many areas throughout the building were disorganized, crammed with gear and evidence, creating non-compliant areas and safety hazards. These conditions contributed to a lack of employee morale. Recognizing these issues, the village planned to convert an abandoned 79,300 square foot plant into a contemporary police headquarters. Forming a “New Headquarters Team” comprised of department leaders, user committees, representatives from SRBL Architects, the local firm in charge of the renovation project, and representatives from Bradford, the goal was to discuss budgetary goals, key functions for the department, and the role storage systems would play in all of this well before embarking on construction. 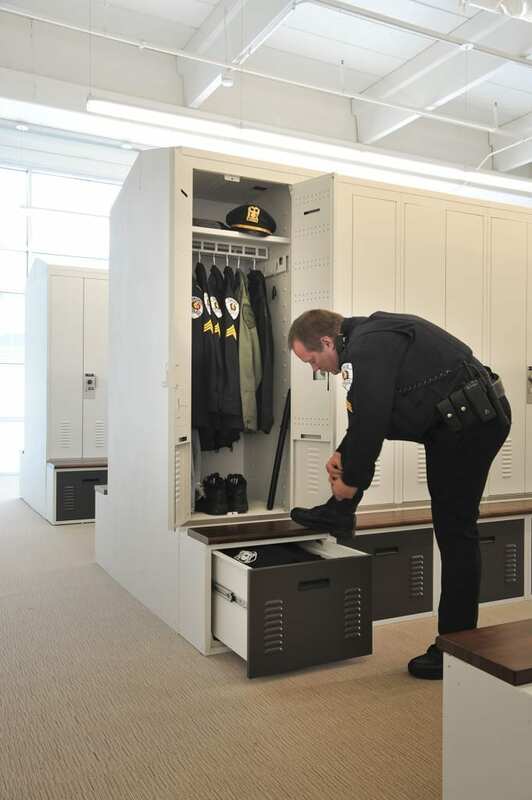 To contribute to this effect, one of the first systems that Skokie looked to improve was the storage for their officers—starting with their locker rooms. 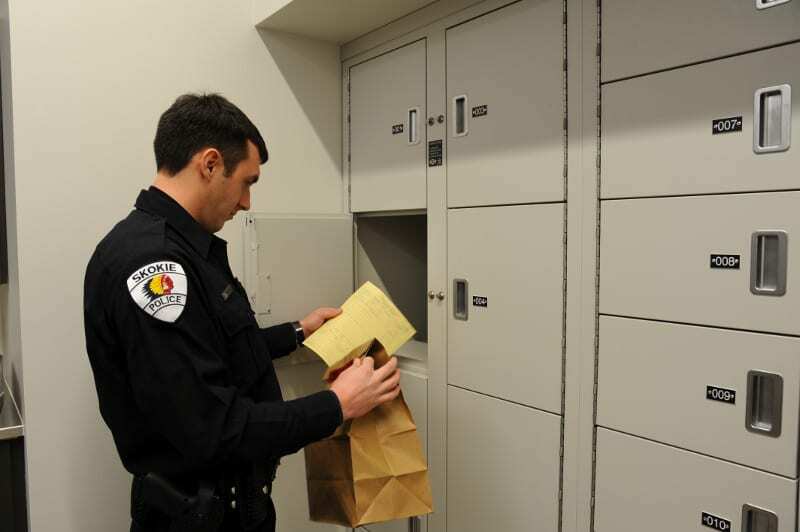 In the previous building, officers’ locker room offered minimum and narrow storage that didn’t have a place for all of the officers’ personal and professional items. 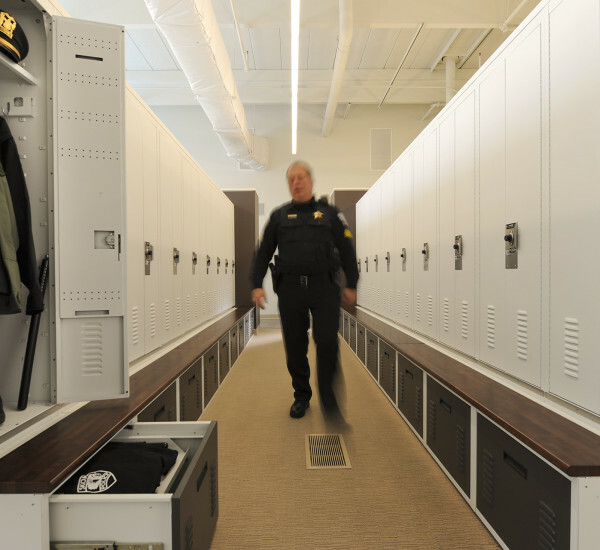 Based on the criteria from the department’s locker committee, we designed over 140 configurable officer gear lockers. 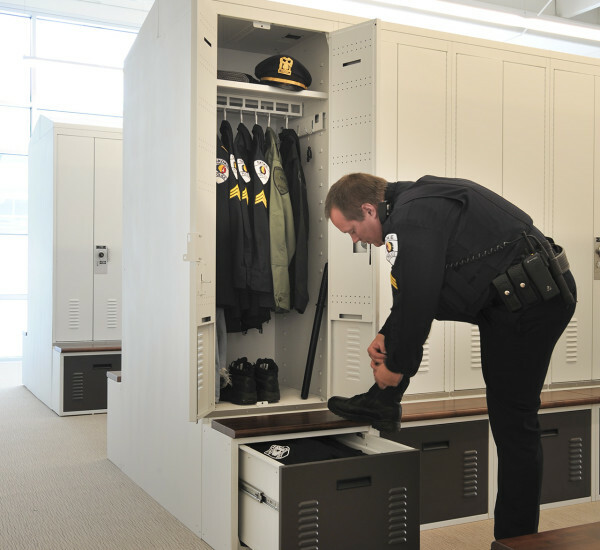 Each two-foot-wide locker includes a bench that also doubles as a drawer for additional storage, double doors that open from the middle, adjustable full-width shelves, garment hangers for personal clothes and uniforms, modular electrical components with duplex outfits for powering and charging radios and other devices, notches on the inside of the doors for duty bag storage, and bracket assemblies to hold additional accessories. For Silverberg, the options were a necessity in making sure his officers had everything they needed. 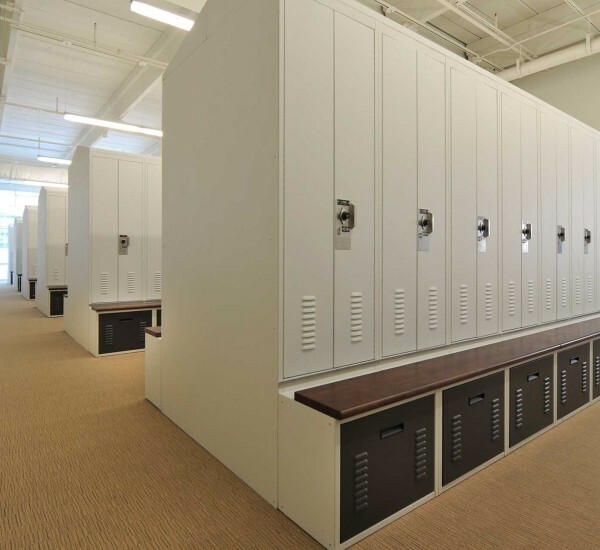 “A properly designed locker goes a long way toward the creation of a positive working environment. 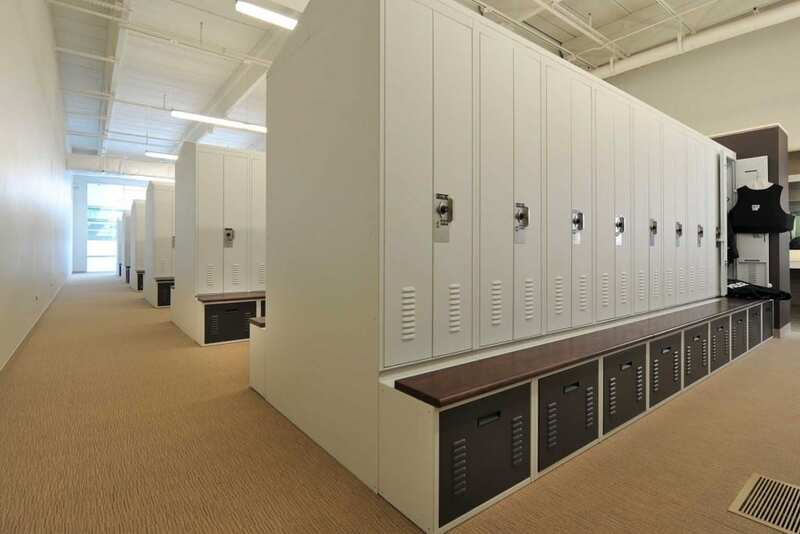 The lockers have had a huge impact of morale, and the attention to detail has paid off,” says Silverberg. The duty of Skokie’s Tactical Intervention Unit (TIU) is to respond immediately to critical circumstances, such as hostage situations and barricaded subjects. The unit needed a storage system that would mirror their movement—organized, quick moving, and easy to access. For that reason, we took a slightly different approach with the lockers for this unit. With the primary goals of readiness and accessibility, we designed 23 open-ended cubbies out of heavy-duty 4-post shelving. The cubbies feature shelves at various heights and provide immediate access to weapons, helmets, shields, gas masks, radios, and additional gear. The cubbies were also built around one piece of essential equipment for the TIU—the fully loaded, 130-pound tactical vests they used during a post. 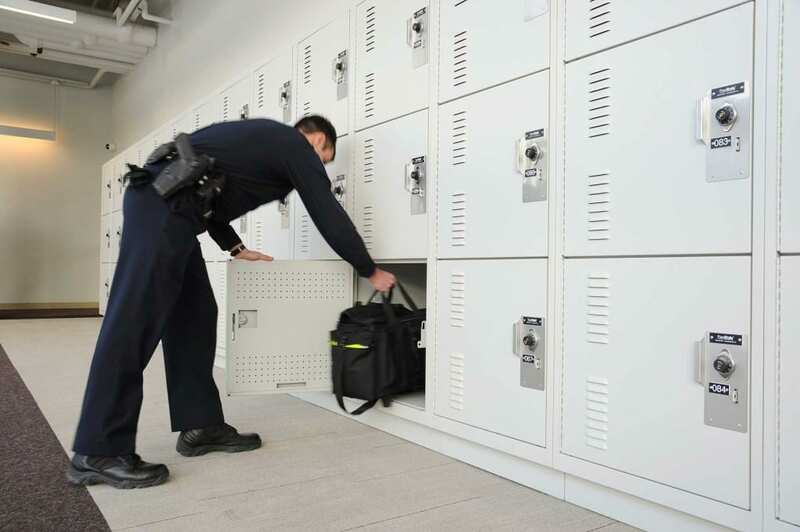 Prior to the new lockers, the department wasn’t able to store the vests in the same place as all of the other gear, creating a bottleneck when it came time to get ready. 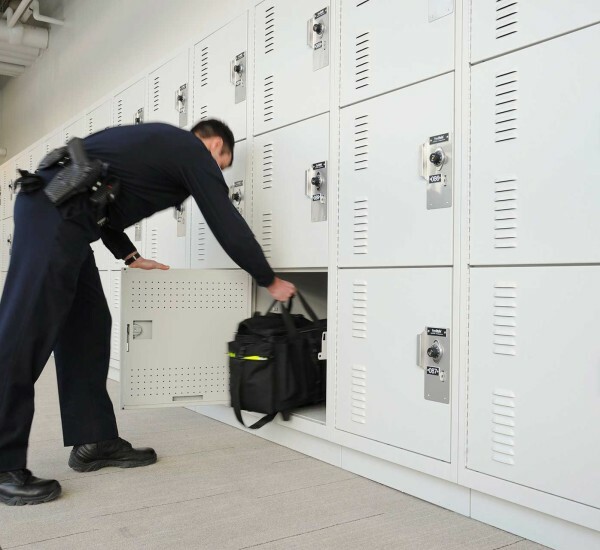 Our standard lockers we use in police department locker rooms were not going to cut it for the primary goals of readiness and accessibility. Therefore, we engineered 23 larger metal open-ended cubbies out of heavy-duty 4-post shelving for a more practical solution to mirror the quick-paced demands of the TIU. 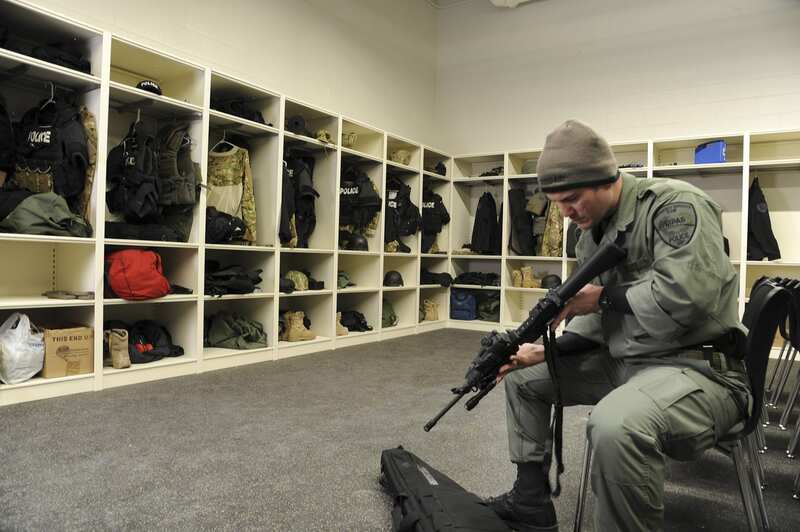 The heavy-duty cubbies features shelves at various heights that provides quick access to weapons, helmets, shields, gas masks, radios, and additional gear. 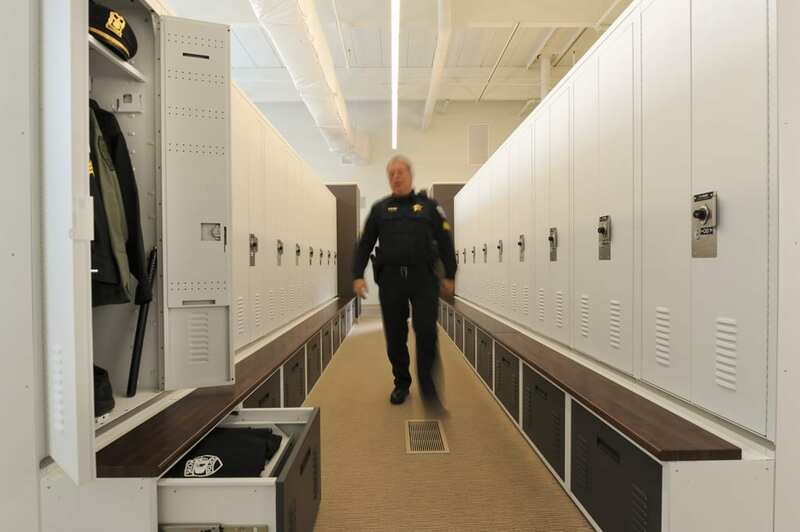 The lockers include electrical outlets and heavy-duty hangers, which allow the officers to hang fully loaded tactical vests, which weigh about 130 pounds. 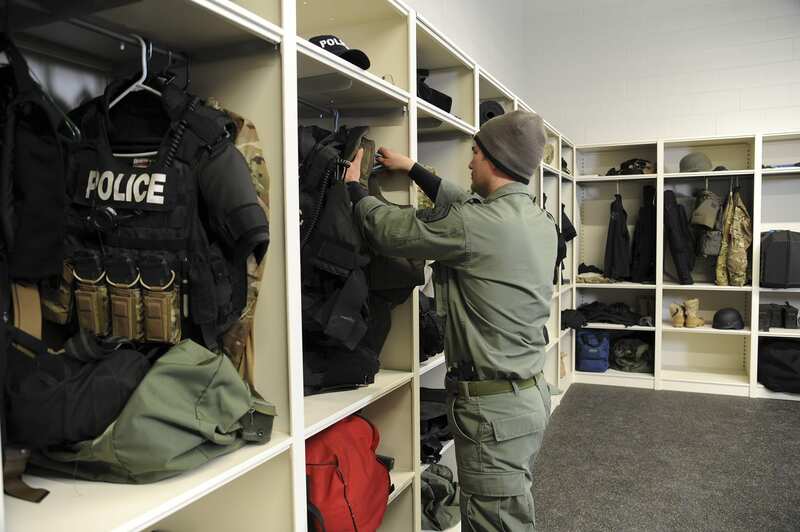 Prior to this innovative and customized solution, the department was unable to store the loaded vests, which ended up creating a not so immediate unit that was needed. A second moveable shelving system was equipped with 4-post shelving for another set of cubbies—this time, smaller ones to store helmets. Storing the helmets in their own individual spaces created a way to prolong the life of the helmets and to keep track of them after practices and games. In addition to helmets, another crucial storage need from a preservation standpoint was the team’s many sets of shoulder pads. Shoulder pads are an awkward size—their bulky nature means that they have to be stored upright instead of being stacked. We designed a customized shoulder pad system with an overhang configuration with cantilever shelving to stack the pads without having them rest on one another—great for preserving the shape of the pads and allowing them to dry out after a game or practice. 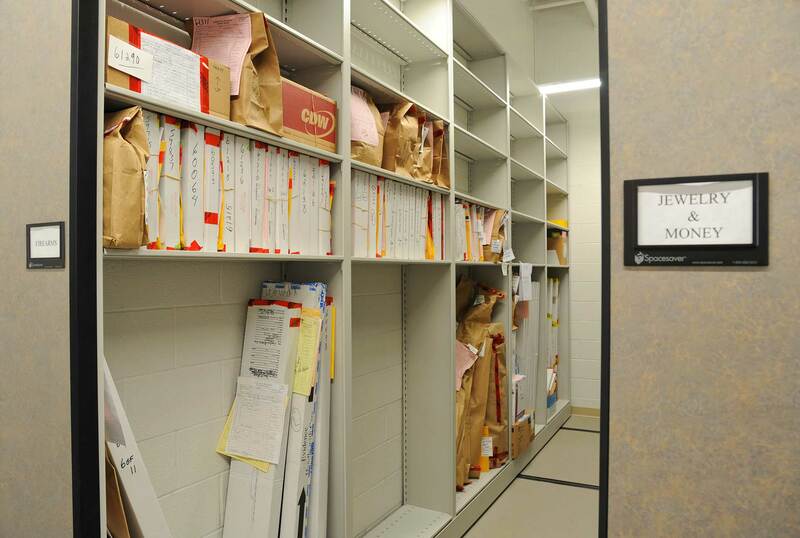 The evidence storage at Skokie was a major concern. 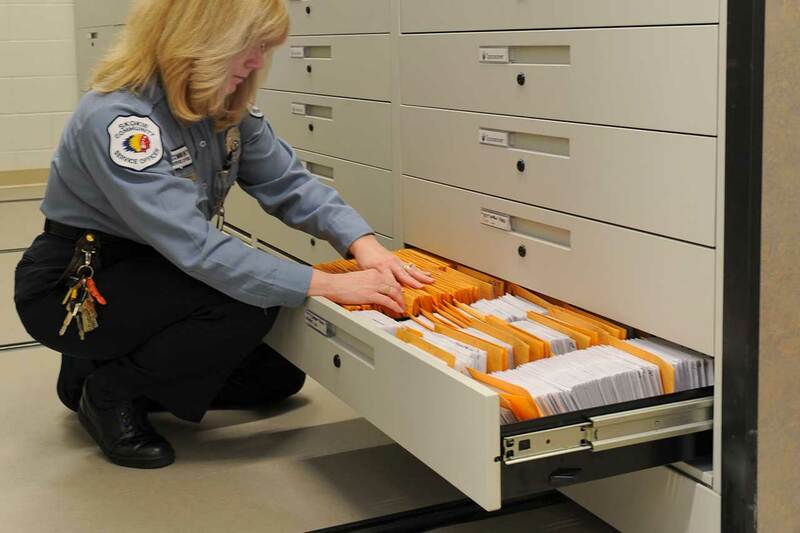 Skokie employs a total of 23 evidence technicians—and evidence is processed 24 hours a day, seven days a week. At the old station, the Property & Evidence room consisted of a converted janitor’s closet, and space was so tight that the technicians had to use the floor to package large pieces of evidence. Refrigerated evidence was kept in an old refrigerator secured by a padlock. 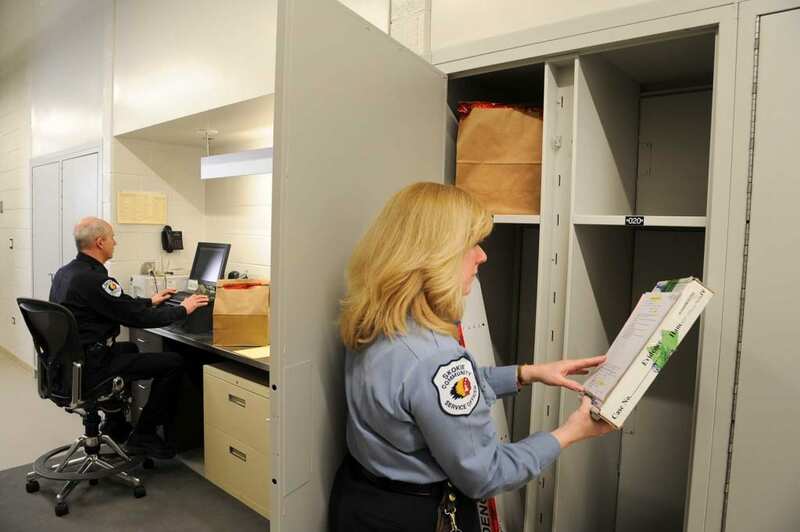 Given the longer periods of time required for holding certain evidence, coupled with the need to protect the integrity of evidence throughout the entire chain of custody, the department installed pass-thru evidence lockers to ensure protection for short-term evidence storage. 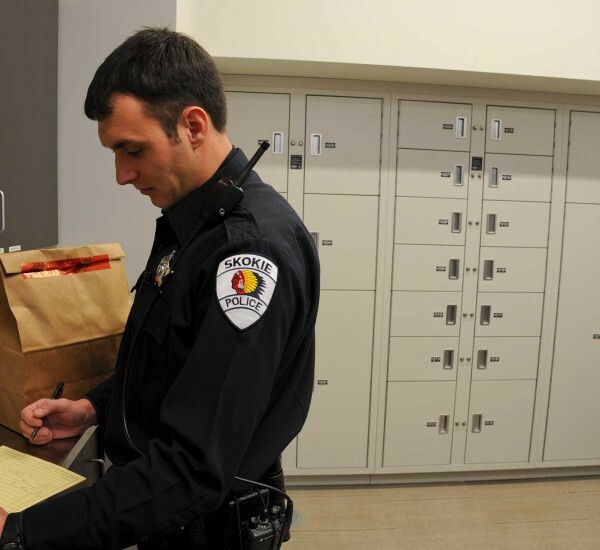 The pass-thru feature allows evidence to be dropped off on one side and retrieved from inside the Property & Evidence room, guaranteeing chain of custody preservation. 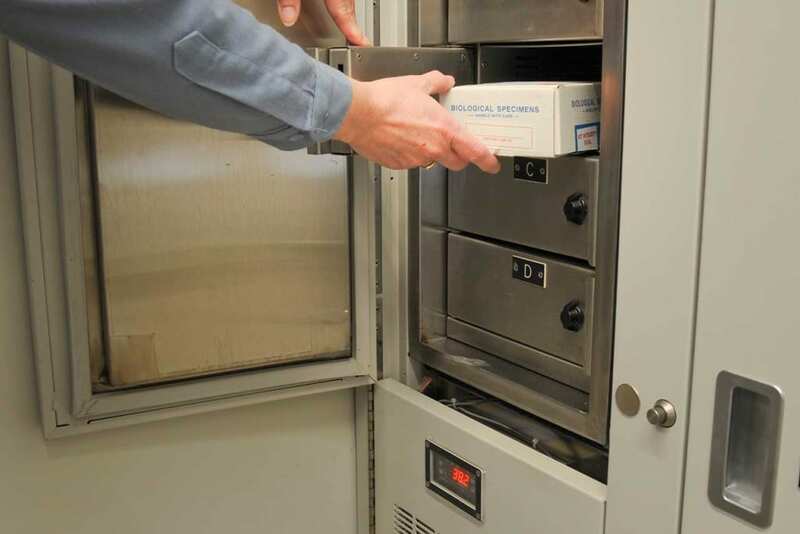 Thanks to a variety of different compartments, the lockers accommodate evidence of all sizes, and also include four double-walled refrigerated components for biological evidence storage. 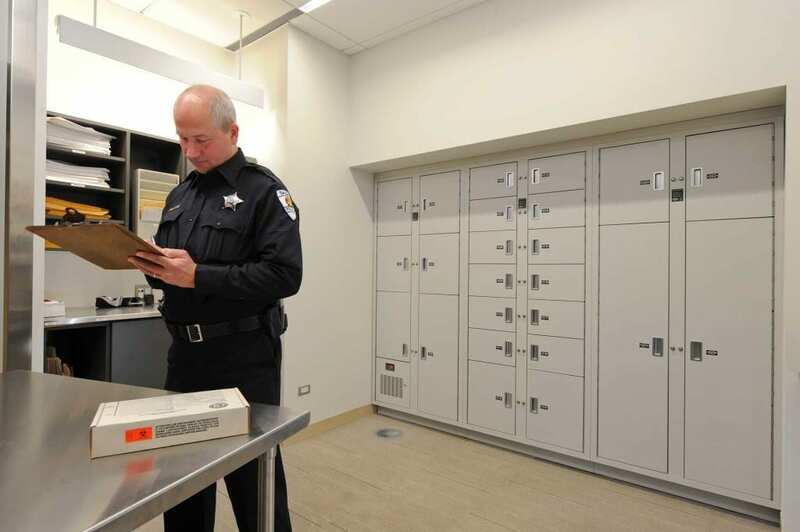 Skokie’s long-term evidence storage also required an upgrade. 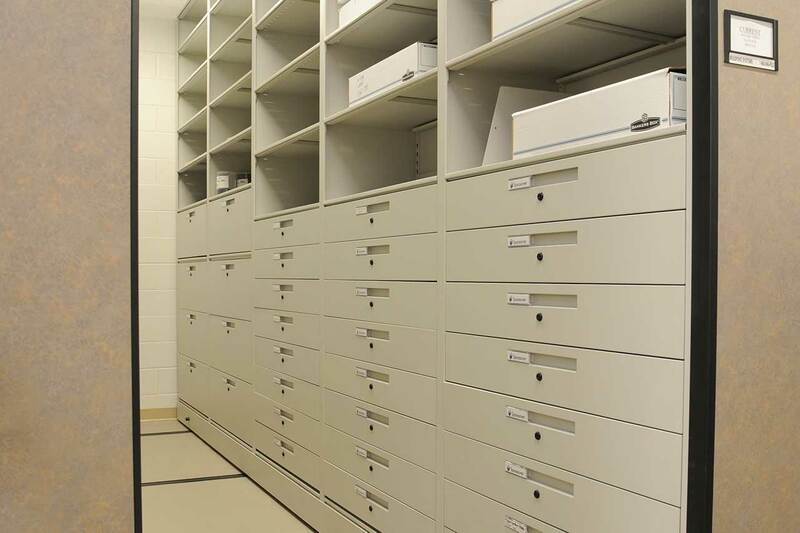 A high-density mobile system was installed to capitalize on space and compact the department’s evidence inventory—while creating enough space for ongoing growth. 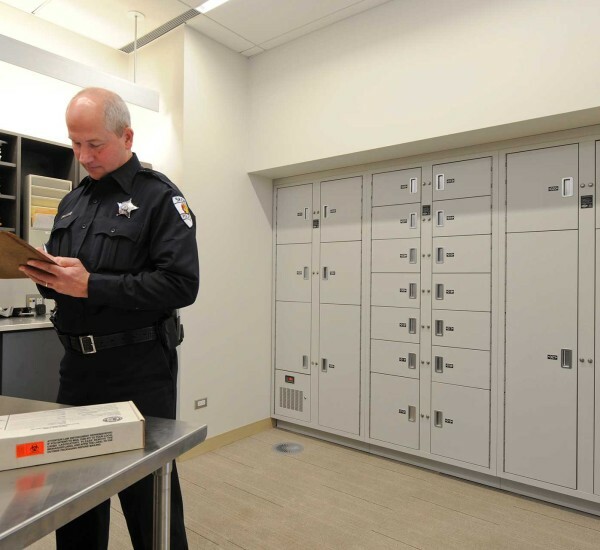 The Village is home to one of the most popular shopping malls in the Chicago area, and one of the largest issues was continually processing and storing large volumes of stolen merchandise. With a compact mobile storage system, there’s no longer concern about where to put the evidence.